We had a chance to go hands-on with the new Lytro camera at CES in a private walkthrough of the device with the company. Since day one, we’ve been critical and intrigued by this camera, and now our opinion has been solidly swayed to excited. The camera is heavier and bigger than we expected it to be (it’s 7.55 ounces), which is a plus in our opinion. 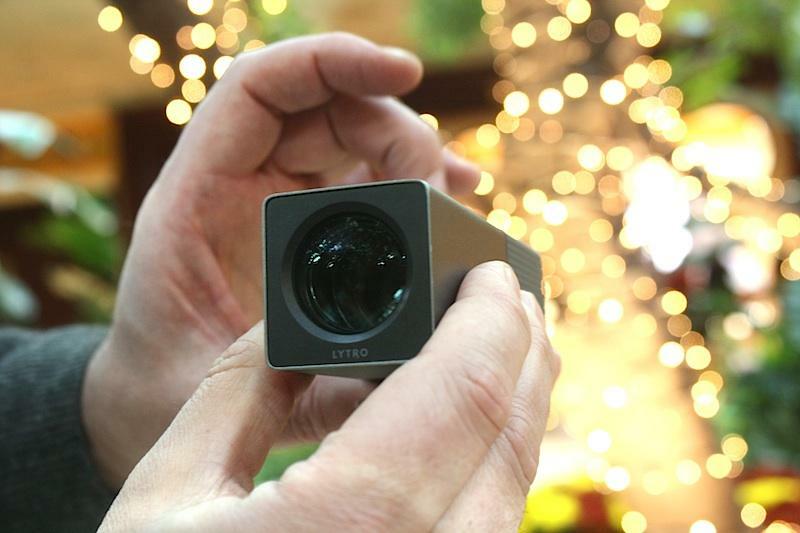 Flimsy, light little things aren’t always best, especially in the case of Lytro, which has a square, small screen. If the thing were any smaller, it would be a problem. We’re also happy to report the camera has a nice, solid feel to it. Sure, it’s exterior is smooth and sleek (with the exception of the textured, rubber grip near the camera’s screen) but it puts a little weight in the palm of your hand that we like. The texturized end of the camera was our favorite surprise. The top of it has a barely visible zoom toggle: tiny, almost unnoticeable rubber is near the end of the camera and running your finger across it back and forth zooms while you’re shooting. We talked to a Lytro team member about this zoom function as well. She told us that it was something of an accident. In the process of constructing Lytro to take in as much light as possible, the camera took on its long tube form–which is what allows it to have its 8x optical zoom. Actually putting Lytro to use is as fun and easy as it seems: there obviously aren’t a lot of manual controls to be had. This is as point and shoot as it gets. There’s a small indented groove at the top of the camera on the rubber piece to click and capture. Director of photography Eric Cheng told us that you need to think about Lytro’s use when you’re shooting with it. This means that you need to frame your shots accordingly. Taking a landscape without much foreground or background subjects won’t really allow the camera to utilize its light field technology. He also said you need to be approximately four inches away from what the object in the foreground. While there were no issues with the shutter, it didn’t have that satisfying click we’re used to with digital cameras–but it was fast. As promised, Lytro doesn’t have to mess with AF and shutter lag, and shooting with it was incredibly quick. It’s also very quiet. 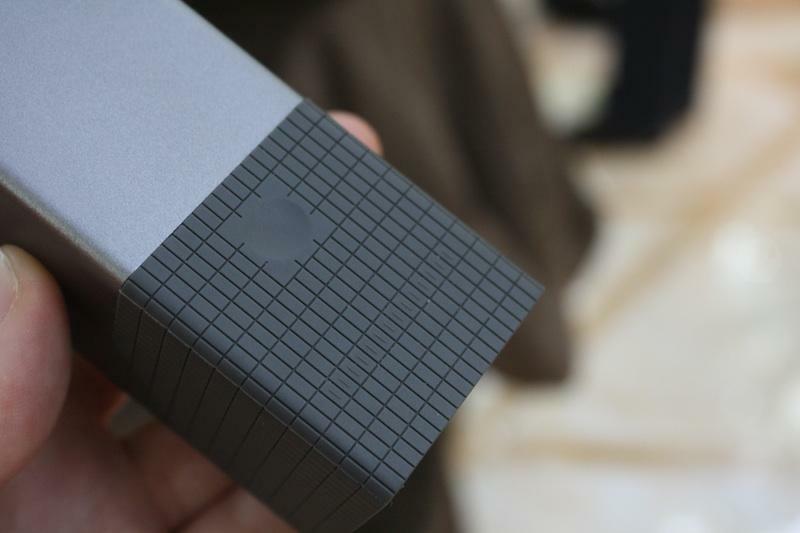 Lytro is a motorized device, yet it’s nearly silent. There’s no audible gear-grinding from zoom in our out or any processing sounds emitted from the camera. We weren’t blown away by the screen, mostly due to its size. We’re getting spoiled by the big, bright, OLED screens some camera companies are putting out there, and being forced into what’s comparably tiny is a little difficult. Your frames also look a little grainy, although we’re fairly confident this is a pre-production only issue. Things can only look so clean on a 1.46-inch, 33mm back-lit LCD screen. We did find touch to be very responsive however, and swiping is how you navigate your photos stored on the camera as well as how you can set exposure (via tapping the screen). Holding the camera is unfamiliar for photographers. It’s nothing like our usual devices, but we were happy to hear a wrist strap is included with the camera. We’ll be able to see the photos we shot at the walk-through sometime within the next few days, when the team puts them up. But you are able to view them via playback on the camera and focus and refocus directly there. It works incredibly well, and fast, just as we experienced with the Web images. We’ll be sure to update when we get a look at the images from the event. Lytro isn’t going to kill current digital photography–it’s just going to be a big, important part of changing it. People won’t forsake their digital cameras and replace everything with Lytro cameras (at least not those that are already in the process of being weeded out of the market), but we’re certain they will be adding it to their lineup. On the surface it might sound gimmicky, but at it’s core Lytro is a new step in the digital imaging evolution, and it’s going to shape the direction camera makers take their products. There are so many questions about Lytro that remain: are other manufacturers going to partner or try and lease the technology to weave it into their own devices? And how long until every major photo-sharing platform has included the ability to focus and refocuses Lytro pictures? How long until mobile operating systems have access to the interactive software for Lytro that is currently only available for Mac OS X (and in development for Windows)? Probably not as long as you might think. Lytro tells us that demand has been huge, and that these things are mere months away from making it into consumers’ hands. So while we don’t have all the answers about Lytro, we’re dead sure of one thing: light field cameras have arrived and they’re not going anywhere.